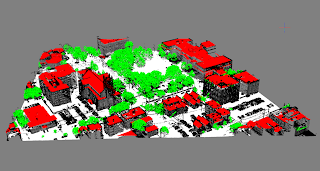 LiDAR (Light Detection and Ranging) is a powerful radar based technology for creating virtual models of physical surfaces and environments . A LiDAR scanner attached to a helicopter, for example, can scan the ground and record information about elevation and ground type, buildings, vegetation, roads, and any other visible structure. Electric utility companies use LiDAR to survey transmission lines remotely, and first responders can use the technology to assess ground conditions after a natural disaster. 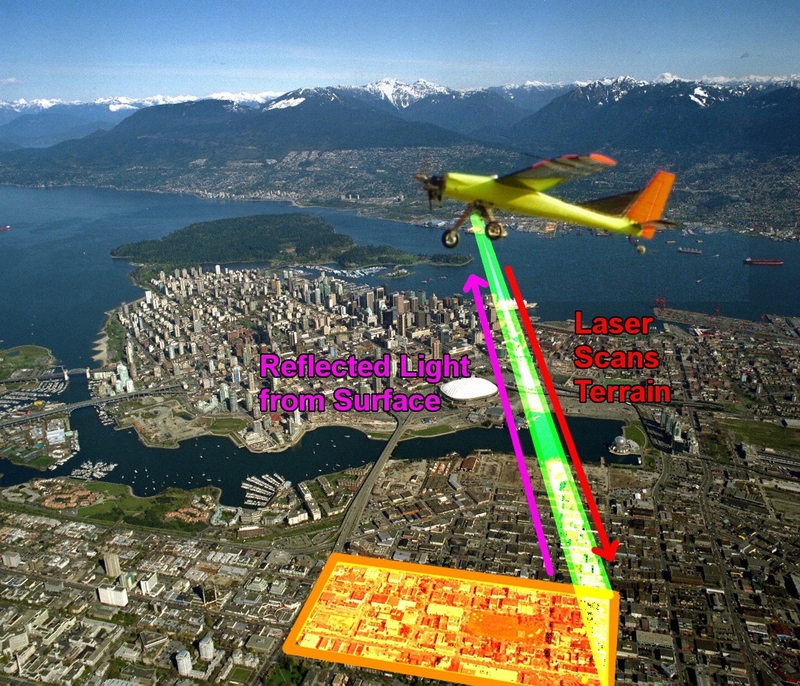 LiDAR works on the same principal of radar, but bounces light off distant surfaces instead of sound. A closer surface will return a reflection more quickly than a more distant surface, indicating the distance of a reflection's source point from the sensor. The brightness of the reflection indicates what material the laser. is reflecting off of, allowing the sensor to different feature types more easily. As the LiDAR sensor moves, it precisely calculates its location using GPS, accelerometers, and other motion sensors. As the laser sweeps the surface of interest, the precise location of each point is recorded along the delay and brightness of the reflection. This collection of measurements is assembled into a 'point cloud' which can be used recreate virtual models of the surface's 3D features. The differences in the brightness and delay of the laser's reflection indicate information, and this information is organized spatially within the point cloud. 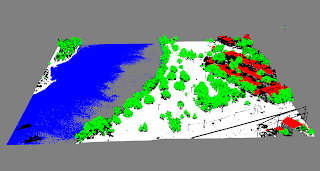 False color is used to differentiate different features and objects out of the point cloud data set. 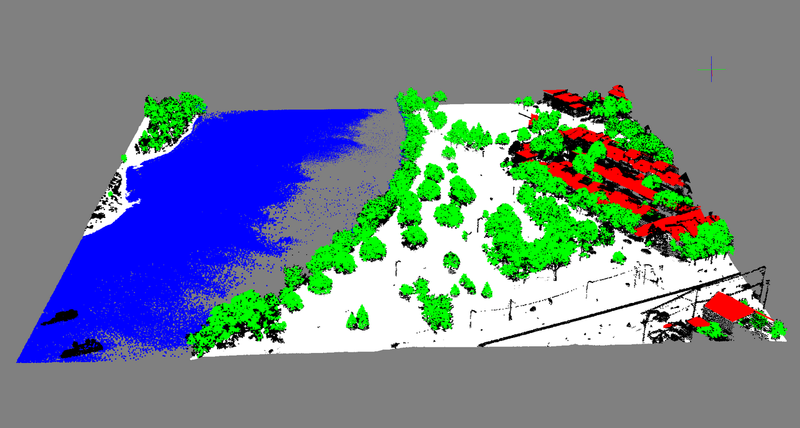 As shown in the image below, this false coloration helps the viewer identify distinct features and objects within the point cloud. LiDAR has many practical applications. Utility companies and construction companies use the technology to survey existing or planned pipelines, electrical lines, roads, and buildings. Huge areas of land can be surveyed quickly and in fine detail from the comfort of a helicopter or small plane. Researchers can even use LiDAR to record and model the exact layout of historic buildings, statues, caves, and other culturally important sites. These high resolution 3-D virtual models can be studied by anyone around the world without travel to the site. Additionally, the current condition of the site is preserved, and researchers do not risk further degrading the site by visiting it in person. 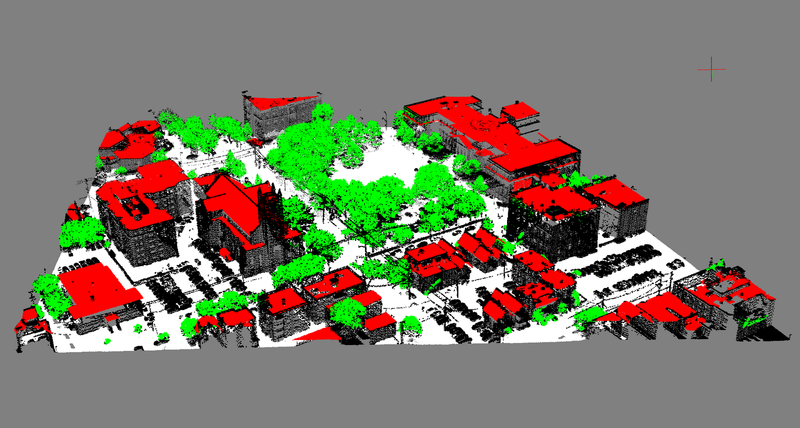 LiDAR is a great tool for remotely measuring the physical environment in great detail. It can be used to survey hundreds of miles for a trans-continental pipeline or freeway, or to model indoor areas with a ~3 MM resolution. 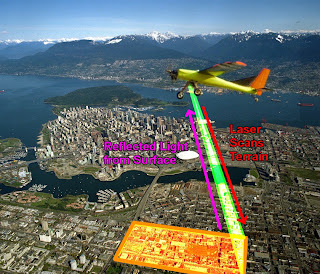 Ultimately, LiDAR will allow anyone with an internet connection to explore large parts of our world in great detail. 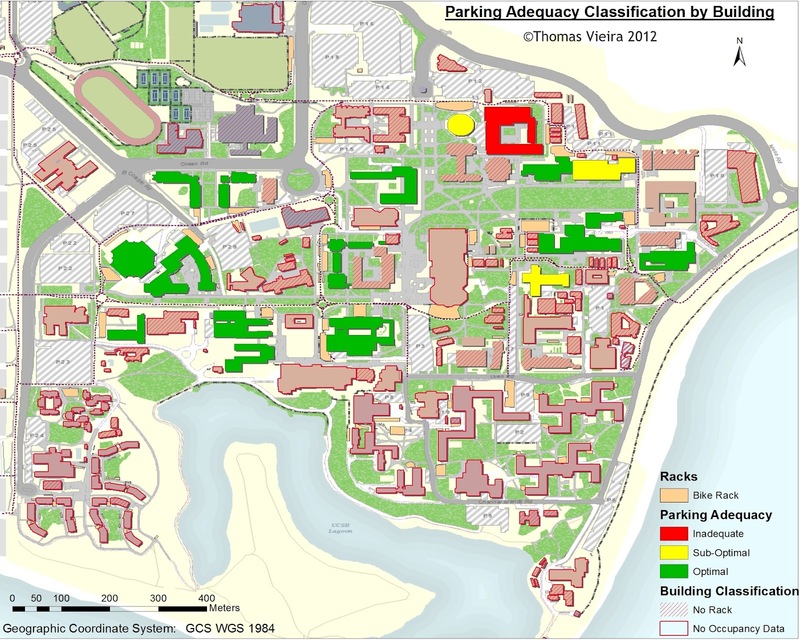 As part of my emphasis in Geographic Information System Science, I recently completed a quarter-long project in which we produced updated maps of on-campus bicycle parking as well as spatial analysis of parking adequacy on campus. Using ArcGIS, my team updated locations of all racks as needed and collected additional 'attribute' information describing the condition of each rack. We then created a web map service using ArcServer where a user can see the location of each rack, and chose a rack which best suites their parking needs. Below is is an excerpt of our final paper. Please view the online map, and slowly double click on any bike rack (dark blue) to view additional info about the rack. Bicycles are everywhere on the UCSB campus, and it seems as though bike parking is constantly in short supply. Racks are not available near all buildings, and existing racks are often full or in poor condition. According to the survey administered by Associated Students Bicycle Improvements Keep Everyone Safe (A.S. B.I.K.E.S. ), 80% of students ride a bike to class every day. Many maps of bike rack locations exist, but they are often outdated and do not contain any information regarding the capacity or condition of racks. 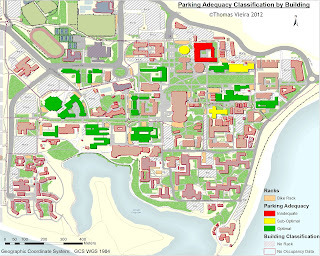 The UCSB community would benefit from an updated, comprehensive map of campus bicycle parking. For each rack, the map would indicate surface type, presence of night time lighting, presence of U-lock accommodating space-saver racks, as well as the number of spaces. Such a map would aid campus administrators and planners in understanding where additional rack capacity is needed, and where racks need safety or capacity improvements. 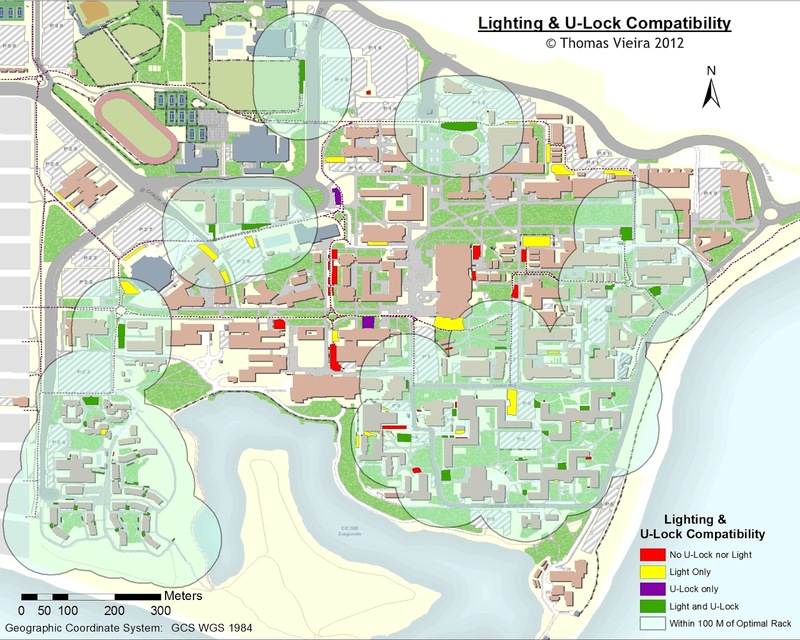 Ideally, all buildings on campus would be located in close proximity to lighted, paved, space saving racks. A key benefit comes in that U-locks are easier to use properly with space-saving racks, and so greater distribution of these U-lock compatible racks would increase securely locked bicycles, and decrease bike and wheel theft. Students can utilize the map via an interactive online portal, which shows each rack along with detailed attribute information to aide informed decision-making. For example, a student working late on campus may want to find a rack with nighttime lighting. On a rainy day, students may wish to find racks that have pavement instead of dirt surfaces. Some students may wish to seek out space-saving racks for their convenience or security. A key outcome of this project was the development of a method of comparing spatial densities. 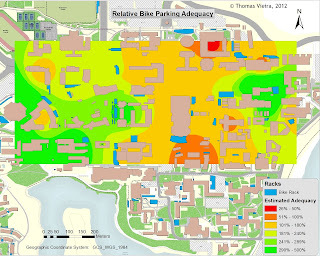 Density comparison is an ongoing challenge in GIS, and we have developed a workable solution which, given certain assumptions about bike rack demand, we were able to use to produce a map of rack adequacy for a large portion of main campus. Based on our own experiences as biking students and the survey information provided by A.S. B.I.K.E.S., we identified several variables relevant to bike parking security. An important objective of the project was to identify U-lock compatible bike racks. A U-Lock compatible rack allows the owner to lock the frame of the bike to an immovable surface, which makes it less vulnerable to theft. Another variable related to the safety of the bike and the owner is whether or not a bike is parked in a lit location. We also specified the type of pavement as cement, gravel or dirt based on our manual data collection in order to objectively classify rack quality. We formulated several project goals. Our primary goal was to create a new ICM layer of the campus bike parking data that would clearly show locations of bike racks and the number of spots per rack in order to increase the decision making capacity of the community. We also planned to determine where additional bike racks are needed by performing an analysis of building occupancy. The project began with a visit to every bike rack on campus. Group members collected detailed attribute data including rack name/description, pavement type, and number of spaces, as well as ‘yes/no’ values indicating the presence of night time lighting or space-saver racks. Campus Planning and Design provided a geodatabase feature class containing most campus bicycle racks and we converted this feature class into a shapefile. The attribute data collected for each feature was then input into the shapefile’s attribute table using the ‘editor’ toolbar in ArcMap. Each rack was assigned to the nearest building in the building layer of the interactive campus map using the spatial join tool. The summarize tool was then used to produce a table which indicated how many racks were assigned to each building as well as the total number of parking spaces available for that building. In order to determine if a building had adequate bike parking, we obtained Gaucho On-Line Database (GOLD) enrollment data for Spring 2012. This data was then parsed to determine the peak building occupancy for each building on campus for which data was available. We calculated each building’s bike parking needs based on 80% of its maximum occupancy, as A.S. B.I.K.E.S survey data indicates that 80% of students use a bicycle to get to class every day. A new “rack adequacy” field was created in the rack shapefile attribute table, and then was populated using the field calculator tool. For each building, the rack adequacy percentage was determined by dividing the number of spaces by 80% of expected peak occupancy. A rack adequacy of 100% or above is considered to have optimal parking, 50-100% was considered adequate, and less than 50% was considered sub-adequate. This map shows the attribute data collected for the different racks. If a rack was both u-lock compatible and lit at night, this rack would be designated as 'optimal.' 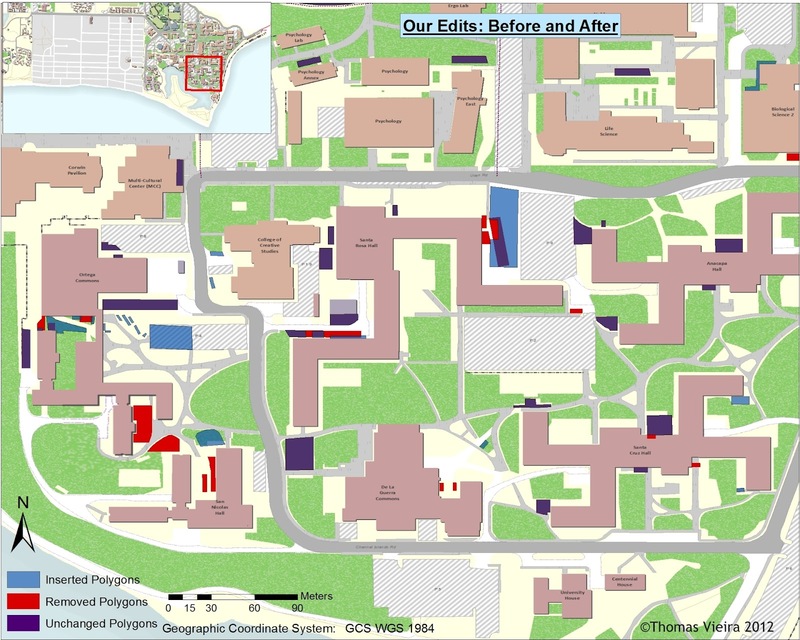 The map below shows areas of campus within 100 meters of an 'optimal rack.' There is a large corridor of campus from the University Center northeast to campus green and the engineering building which is not served by optimal racks, and these areas should be highest priority for rack upgrades. lit at night, both, or neither. 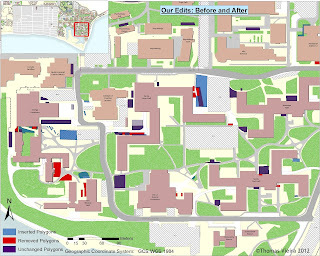 This map shows a section of campus where on-going construction necessitated substantial edits to the existing rack locations. Polygons which were removed are indicated in red, while polygons which were added are indicated in blue. Purple polygons, where blue overlaps red, means that the original polygon did not need to be edited. Examples of changes made to rack locations. 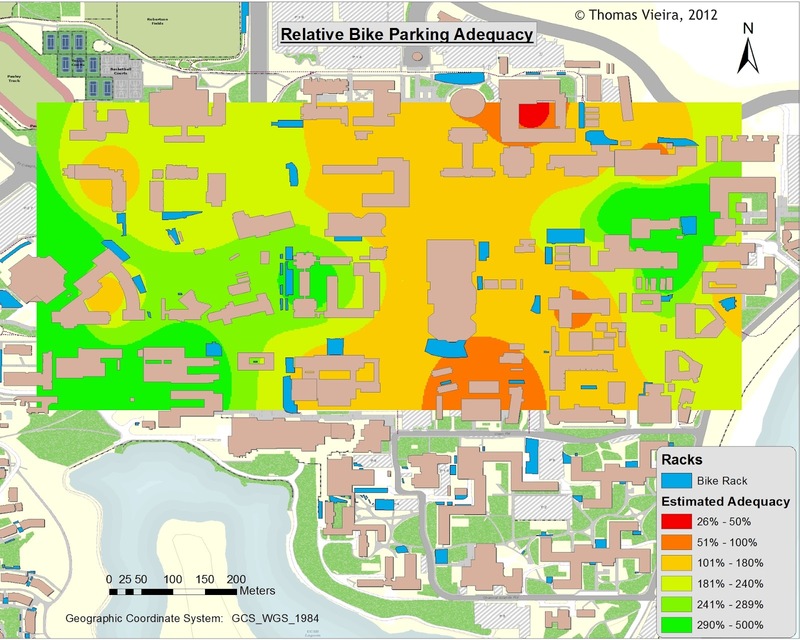 To determine whether bike parking adequately served any given part of campus, we compared available rack spaces with the expected peak occupancy of surrounding buildings. In reality, any given rack serves more than one building, and any given building is served by more than one rack. We were unable to model this complex spatial relationship between racks and buildings in the time allotted for the project, so we created the simplified assumption that each rack exclusively serves the nearest building. This assumption allowed us to calculate how many spaces were available for each building. Research by A.S. B.I.K.E.S., the organization in charge of bicycle affairs on campus, indicates that 80% of students arrive to class by bicycle. Therefore, we decided that a building's parking will be considered adequate if there is enough bicycle parking to accommodate 80% of the building's peak expected occupancy. We than compared the number of spaces with this 80% occupancy estimate, and classified the buildings as either optimal (>100%), adequate (50-100%) and sub-adequate (<50%). Adequacy rating for each building. This analysis was complicated by several factors. We only had occupancy data for buildings which have scheduled classes, so heavily used buildings such as the library and university center were excluded from this analysis. Additionally, there are several examples where several buildings share one large bicycle rack, even though our analysis would assigned this rack's capacity to one building. Overall, we determined that Campbell Hall, Ellison Hall, Phelps Hall, and Buchanan Hall all need additional rack capacity. A new rack is scheduled for installation on the eastern side of campus green, but not other racks may be installed in this area due to lack of bicycle path access. Click here to download the full final report. Note: contains high resolution map images, so downloads may take a minute.